Personal Development for the 21st Century: What Does Success Look Like? Who would you judge is more successful? Someone who drives a 1979 Ford pickup truck or someone who drives a brand-new Mercedes sedan? Someone who has lived in the same house in Omaha, Nebraska since 1958 or someone who has just traded up to a custom home on 5 acres in an exclusive development? If the man driving the pickup truck was Sam Walton, founder of Wal-Mart, he would definitely be more financially successful than whoever was driving the Mercedes. If Sam were alive today, he would be the richest man on earth with a net worth of $80 billion, surpassing even Bill Gates (at a paltry $59 billion). Even after Sam made his fortune, you would never pick him out of a crowd as a rich man. He still drove his 1979 Ford pickup truck and wore Wal-Mart clothes. The second-richest man in the world, Warren Buffet, is worth $52 billion and has lived in the same house in Omaha, Nebraska since 1958. These examples illustrate that it is difficult to judge a person's success by appearance alone. Even so, TV shows, newspapers and magazines never tire of telling us that we're not successful unless we live in a big home, drive an expensive car, and wear a certain brand of clothing. Trying to convince us that we can't live without their product. Trying to convince us that buying their product will improve our lives. Often, products are linked to desirable lifestyles and/or beautiful people. The GMM will say "If you buy my product, you can be beautiful too!" and "If you buy our product, look at all the fun you can have!" Advertising even exists in movies and TV shows. The next time you see a movie character drinking Coke instead of Pepsi, realize that Coke probably paid a hefty fee to have their product prominently displayed. This is called "product placement". If you ever visit Texas, you might hear someone say, "He's big hat and no cattle". Someone is "big hat and no cattle" when they look successful and prosperous (by wearing a big hat), but aren't (they don't own any cattle). Just because someone drives a BMW doesn't mean they're successful. Anyone can lease a BMW for a few hundred dollars a month. There are a lot of people who drive Mercedes Benzes but live in shacks. They wear Rolexes and fashionable clothing but can barely pay their electric bill. There's nothing wrong with driving a Mercedes as long as you can afford it. The problem lies with people who take on huge amounts of debt trying to present a facade of success. The big homes come with big mortgages, the fancy cars are leased, and the fashionable clothes are purchased with credit cards. Little do people know that taking on debt subjects them to financial servitude - a form of slavery - where their debt determines how much they have to work, often at jobs they don't enjoy. By allowing others to define success for us, we give them power over our lives. If we let them tell us how to spend our money and go into debt buying their products, we let them control how much time we spend at our jobs. We should all strive to be "no hat, but lots of cattle". There's a certain power that comes from driving a 10-year-old car but knowing that, if you wanted to, you could walk into a car dealership and write a check for a new car. We can't stop the deluge of advertising that saturates our lives. However, by being aware of the GMM and its methods, we can minimize the destructive impact on our finances. Don't let others do your thinking for you. Control your mind and your thoughts, and you can control your money and your life. 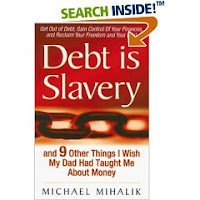 This guest post was written by Michael Mihalik, author of Debt is Slavery: and 9 Other Things I Wish My Dad Had Taught Me About Money (Paperback). Read his book to learn how to gain control of your finances, pay off your debt and create financial security using the same techniques Mike used to triumph over a paralyzing amount of debt. Available at Amazon.com or Amazon.co.uk . I love this article. So many people ask me why do you want to be successful? If you had a million dollars, what would you spend it on? What sort of house would you live in? What car would you drive? Build your dream board with photos of what you want to own to create a desirable livestyle. By craving such financial goals, we are indeed buying into someone else's goals machine which makes them rich. Personal development is not just about having things. It is about being someone. Investing time in others to help them achieve what they want. I have a Dutch exam next week and today took three hours out of my precious time to visit a course member who has broken her leg just to give her some papers to help with her revision. Did I have to do that? No, I could have sent them but she might not receive them in time. I took the time to help someone else and by so doing, focussed on some of the revision for myself and listened to excellent training CDs in my car from Success University. Training CDs which otherwise might be gathering dust. Don't get me wrong. I would love millions in the bank but not to go on spending sprees because I know that consumerism is an insatiable drug. We quickly tire of the new purchase and want to upgrade so it does not provide satisfaction. It is too easy to obtain credit to "Buy now, pay later" but the true cost of compounded interest is scary. Buying consumable goods on credit is foolish. As the article states, so is leasing a fancy car to look good. I was once told "Fake it till you make it". When German football star Jurgen Klinsman moved to Tottenham Hotspur, Mercedes wanted to give him a top of the range model free. He declined, preferring his comfortable VW Beetle. The car does not maketh the man. What is inside determines our true grade of success. What is long-lasting is the knowledge of helping someone. Showing others that mediocrity is not the only choice. I suppose I want that to be my legacy. ©Antonia Stuart-James 2008 from and Personal Development in the 21st Century and The Secret and Law of Attraction .